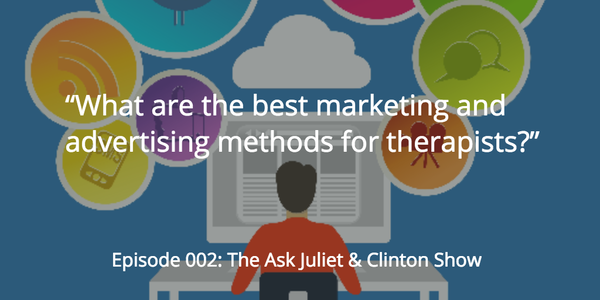 Episode 002 - What are the best marketing and advertising methods for therapists? Episode 002 – What are the best marketing and advertising methods for therapists? In this episode, Juliet and Clinton answer questions about Facebook advertising, the difference between marketing and public relations, ethical marketing guidelines for therapists, and how counsellors can be sure that a marketing method will work. Andrena: I have been advertising on Facebook now for about 4 – 5 months with no results in the form of people calling to make an appt. There seems to be a lot of people reached with some clicks to my website. Any secrets on how to attract someone to call and make an appointment? Barbara: 1) difference between marketing and PR for the layperson like me and (2) marketing within the ethical guidelines of the counseling industry. 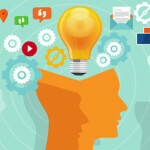 Sandy: How can I be sure the marketing methods I am using will work? What happens if you try something and it doesn’t work? Cara: How much should I spend on a website? Episode 001- What is your advice on ethical social media marketing for therapists? 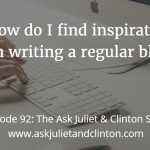 Episode 003 – What is the blogger etiquette for guest posting? 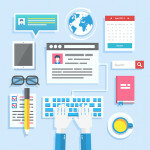 Episode 032: How do you manage information overload? 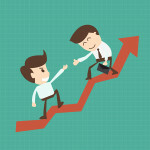 Episode 035: Should I get a mentor to help market my therapy practice?